On August 23rd and 24th, 14 of the HMY girls in Canada had a get-together with Miriam Loveland, a candidate with the Servant Sisters. The Sisters of the Precious Blood opened up their convent to receive the girls. The day on Tuesday began in the yard outside the convent, learning some songs to Our Lady and the “bombas” sung at the summer camps in Spain. After the music, the girls learned how to play Ultimate Frisbee and got to run around a bit. This was followed by a discussion group on the Home's charism and the recent approval of the Home as a Public International Association of the Faithful in Rome, especially about what that should mean for the HMY girls in Canada. 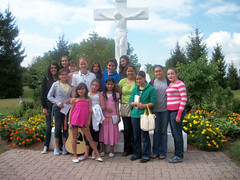 Some of the girls who were able to visit Spain this summer also shared their experiences with the group. The day on Wednesday opened with Mass at the Convent and then points of meditation. As it was Mother Ana's birthday, the girls spent the morning inventing a skit and writing her a song in order to wish her a happy birthday from Canada. 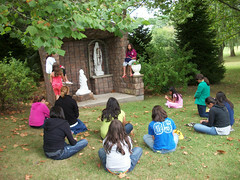 After a lunch of singing the newly-learned "bombas," everyone gathered around the grotto to Our Lady to pray the rosary, offering it for Mother Ana on her birthday. After the Rosary, there was another meeting about the Home, specifically concerning the commitments within the Home of the Mother of the Youth. They then went into the chapel and the girls were able to make, or renew, their commitments within the Home of the Mother of the Youth. Two girls renewed their commitments as apprentices, six girls renewed as experts, and one entered the Home for the first time, also as an expert. The girls also discussed the upcoming World Youth Day in Madrid: its importance, as well as brainstorming ideas for fundraising to get there. These were two days of soaking in the charism of the Home while growing in love for the Eucharist, Our Lady, and apostolate with the youth.